When a query is executed in sql server 2005 management studio, the results when show in grid format has the headers and results. When one wants to copy the results to excel, it does not copy the headers by default in sql 2005. 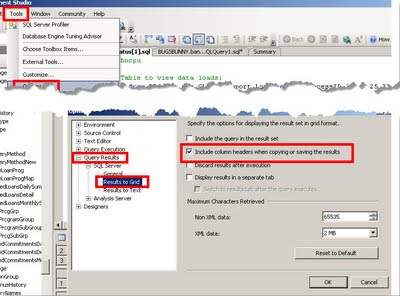 In sql server 2008 there is options in the results which says copy the results with headers. In order to achieve the effect, there is an option in sql server 2005 management studio to copy results with the headers. Below is a screen shot: Once the option is set when the results are displayed in grid format, the data can be copied with headers to excel.